Remember the New Fantastic Four, a short-lived 1990 incarnation of the team featuring Spider-Man, Wolverine, Hulk, and Ghost Rider? Next February, Marvel Comics will pay homage to that wacky roster with a story arc in Venom starring Red Hulk, Venom, X-23, and Ghost Rider. In a conference call today, io9 learned firsthand of this yet-to-be-named story, which will hit stands February 2012. Writers Rick Remender, Jeff Parker and Rob Williams were on hand with illustrator Tony Moore and Marvel editor Jeanine Schaefer to discuss "The Venom Event," a tribute to Walt Simonson and Art Adams' original team-up. All of these heroes are working through a lot of stuff, learning how to be heroes, learning how to work with other heroes. They're all in their own way [non-traditional heroes] who are dealing with that in their own series. They're all on a slow spiral downward when they all find each other. The character is trying to bring another dimension to Earth, and it's a not-so-pleasant dimension. The villain is succeeding in doing this. The story takes place in Las Vegas, where our mischievous bad guy is the owner of a giant Hell-themed casino that we jokingly call "Hellagio." During the course of all the other stories, Flash has been sent on a mission to Las Vegas, and his life is low. Captain America has sent the Red Hulk to investigate. 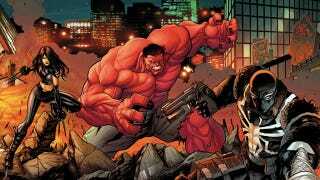 Red Hulk and Venom are on a crash course of sorts, as are Ghost Rider and X-23. The event that take place in Las Vegas won't be completely resolved after this and will have an interesting new tone going into the next couple years, and the potential for what you can still find in [Vegas]. One of the big gags of the first New Fantastic Four is that they were an exceedingly dysfunctional bunch — ditto will go for this new line-up! Rob Williams quipped they're like a rock band "that travels in different buses," with Remender noting that "the new Ghost Rider is very ill-tempered." We're answering the question, "Does a clone have a soul?" If fans are receptive to this team-up, the creators promised that this unlikely squad could come back together in the future. Will this disgruntled foursome confront their inner demons with trust falls and icebreakers? Or will they stay surly and bust some skulls? Fans will find out in "The Venom Event" when it runs in Venom 13, 13.1, 13.2 and 13.3 in February before wrapping up in March's Venom 14.